I make a lot of desserts that are incredibly time consuming. It is, most of the time, worth the extra time and effort, but, there are times, when I don’t really want to spend five hours in the kitchen. That is where this tart comes in. It is not only incredibly delicious, but also fast and easy to make. Delicious and easy. You can’t really beat that! It’s only downfall is that it may be too rich for some people. Personally, I don’t know the meaning of the words “too rich,” but, you know, some people just can’t handle it. I call those people “wimps.” As far as the recipe itself is concerned, I think the addition of the candied ginger on the top is a must. If you eat a little bit of the candied ginger with each bite, it’ll bring a whole new level of flavor to the cake. If you hate candied ginger, have no fear, the tart will still be super good. I also increased the pepper from ¼ to an 1/8 and added a bit of cinnamon to the base, which I think helps to balance out the chocolaty goodness. You can find the complete recipe after the jump. Preheat oven to 325°F. Finely grind gingersnap cookies in processor (yielding 1 1/2 to 1 2/3 cups). Add melted butter and salt; process until moistened. Press crumb mixture firmly onto bottom and up sides of 9-inch-diameter tart pan with removable bottom. Place pan on rimmed baking sheet. Combine finely chopped bittersweet chocolate and heavy whipping cream in heavy medium saucepan. Whisk over low heat until chocolate is melted and smooth. Remove saucepan from heat. Whisk egg yolks, egg, sugar, flour, cinnamon, ground black pepper, and salt in medium bowl to blend. Very gradually whisk chocolate mixture into egg mixture until smooth and blended. Pour chocolate filling into crust. Bake chocolate tart until filling puffs slightly at edges and center is softly set, about 30 minutes. Transfer to rack. Sprinkle chopped crystallized ginger over top. Cool tart in pan 20 minutes. Gently remove tart pan sides and cool tart completely. 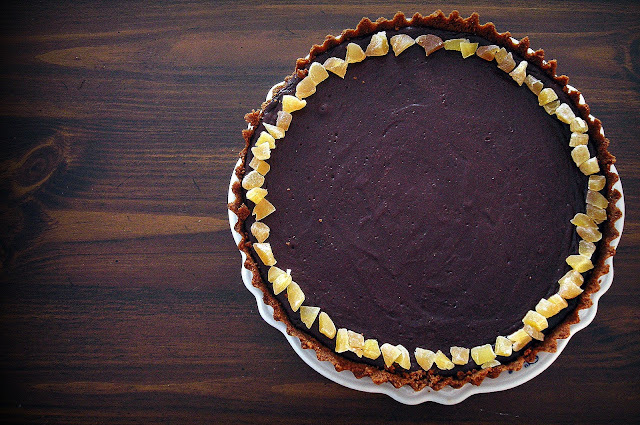 DO AHEAD: Chocolate tart can be made 1 day ahead. Cover tart and refrigerate. Bring to room temperature before serving. Cut tart into thin wedges and serve. Hehe I dint really understand "too rich" either. Same goes for people that forget to eat! This looks delicious! Ha! Yeah, I don't get the "I forget to eat" comment, either! I heard a movie star say that once. "Sometimes, I forget to eat." Huh?